Description: This seminar covers the financial aid process in detail. 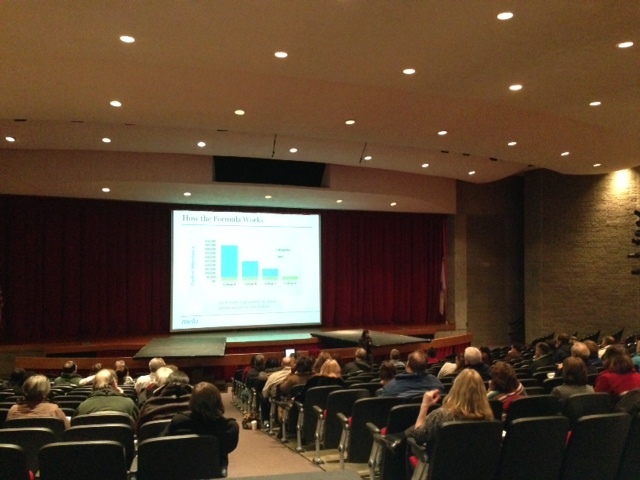 A Financial Aid Advisor will be the presenter beginning at 6:30 P.M. in the BHS auditorium. The KAPLAN program offers SAT/ACT test prep courses at Burlington High School. Burlington juniors receive a subsidized rate of $249.00. Please click here to see the KAPLAN schedule and enrollment instructions. We recommend that BHS Juniors take advantage of the free ACT/SAT practice test on Saturday February 7th, 2015 at 9 AM. This practice test is offered at BHS. Please register by calling 1-800-KAP-TEST. PSAT score reports will be mailed home to parents on Friday December 12, 2014 to Sophomores and Juniors that participated in the exam on October 15, 2014. The PSAT/NMSQT exam is a measure of three key areas: critical reading, mathematics problem solving and writing skills. The exam prepares students for the same types of questions on the SAT exam. In addition, juniors who achieve high PSAT/NMSQT scores may qualify for National Merit competition and corporate scholarships. The Guidance Department at Burlington High School will be hosting a Parent Breakfast on Tuesday November 18, 2014, from 8:30-9:30 AM in the BHS Guidance College and Career Center. This breakfast will be hosted by Michael Westervelt from Google. The purpose of this breakfast will be to help parents understand the impact and importance of your child building a digital footprint in preparation for college. We look forward to seeing you! Please RSVP at by calling 781-270-1780. As in years past the BHS Guidance staff puts a tremendous amount of focus on incoming freshmen. An incoming 9th grader faces many new challenges with the transition to high school. Freshmen are dealing with a new environment, new teachers, more freedom and responsibility, etc. The Guidance staff makes every effort to be in tune with this process and to serve as a resource. Each year Guidance Counselors meet with freshmen in small groups within the first month of school. We call students to the Guidance Office and introduce ourselves, and discuss the many resources available to them. Although we have found this process useful, we also feel it is not enough. In fact, what we have learned from our freshman over the past several years is that they prefer to hear about graduation requirements, academic expectations, how to go about making a level change, etc. For a second year the BHS Guidance staff worked with Ms. Sullivan in the health department. Ms. Sullivan allowed the BHS Guidance staff to teach a lesson during her Freshmen health class. 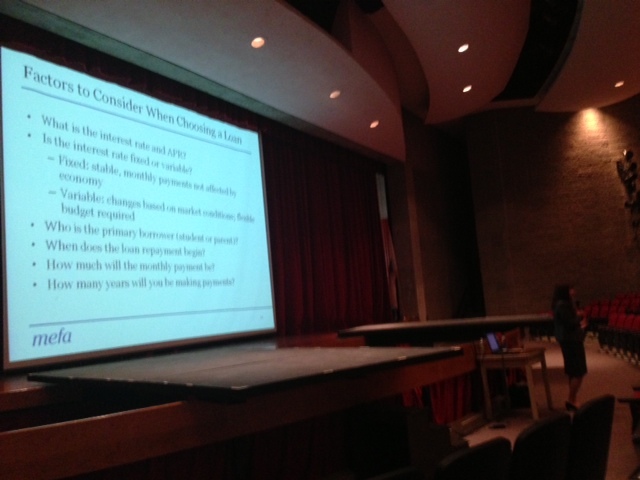 The Guidance staff covered and discussed BHS graduation requirements and the importance of identifying resources. One teaching practice that we used again this year was a “ticket to leave”. The ticket to leave is simply a form that we ask freshmen to complete at the end of the lesson so we can gauge if students understood what was covered. Based on the data, we felt our message was clear to a vast majority of freshmen. We look forward to continuing and refining this practice in years to come. The Guidance Department at Burlington High School will be hosting a Parent Breakfast on Wednesday November 12, 2014, from 8:30-9:30 AM in the BHS Guidance College and Career Center. The purpose of this breakfast is to give parents of Burlington High School students the opportunity to have an open dialogue around stress and anxiety with the school psychologist, Ms. Elizabeth MacKay and the school social worker, Ms. Christine Conceison. Stress and Anxiety impacts all students in a variety of ways. The breakfast is aimed at providing insight into stress and anxiety in adolescents and effective coping strategies. We look forward to seeing you! Please RSVP at by calling 781-270-1780. The Burlington High School Guidance Department highly recommends that seniors create a student account on the Common Application Website ASAP. Burlington High School in conjunction with Bay Path College is happy to offer a fall 2014 course for Burlington High School seniors and juniors. The course will be Principles of Marketing. This is an excellent opportunity for selected seniors (and juniors) to receive dual credit. Dual credit gives BHS students the opportunity to receive college credit and high school credit. Given that Bay Path has a satellite campus at BHS travel requirements are minimal. Click here for an application and details or stop by the Guidance Office to pick up an application. 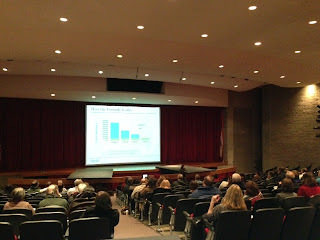 The Financial Aid Night for parents was well attended. Many aspects of the financial aid process were covered. Heather Ward, from Discover, covered all aspects of the financial aid process. Two very important forms were mentioned last night. The FAFSA and the CSS profile. We encourage parents to investigate both applications ASAP. (Please note, however, that, like an income tax form, the FAFSA can never be filed for seniors prior to January 1st of senior year.) One clarification we would like to make is the cost of the CSS profile. The fee for the initial application and one college or program report is $25. Additional reports are $16. Please see the CSS profile student guide for more specifics. Fafsa.gov now offers a new feature called the FAFSA forecaster. We recommend parents take advantage of this to determine your estimated financial aid eligibility. For parents that missed the event please click here for the presentation or feel free to stop but the guidance office to pick up a hard copy of the presentation. If you would like to hear the presentation in its entirety, it will be televised on BCAT. Please check the BCAT web-site for specific times. Once again KAPLAN will be offering SAT test prep courses this summer and fall to BHS students. Information will be mailed out on June 17th week, but we wanted to post the schedule for students/parents that wanted to get an early jump on test prep. registration. Registration must be completed as soon as possible. Burlington students only pay $249, which is a reduced price. To register please call 1-800-KAP-TEST. The above codes should be entered on the Payment and Confirmation page when you check out online. Many families focus on the college search, selection and admission process. We believe that figuring out how to pay for college is also an important part of this process. ‘College Financial Aid 101’ helps families understand the ins and outs of college financial aid. This presentation will also address common financial aid myths and real questions from other families going through this process. This presentation is designed for parents of freshman, sophomores and juniors, but ALL parents are welcome to attend. Each spring, the Guidance Department asks the current freshmen for advice for incoming freshmen. Here are some of the things the current 9th graders like best about BHS, as well as suggestions they have for future students to make their first year at BHS both productive and fun. Don't stress out about coming to high school too much! It's not that bad and it goes by quick! Be involved in different clubs and sports, like Science Olympiad and track. Be yourself, have fun and take your grades seriously. Don't stress out. It's not bad. Don't do anything really stupid. Visit the school this summer to find your classes. Don't be afraid to take honors English. Pack your backpack with only the things you need. It's normal to ask teachers for extra help. If you need help, go to a teacher. Do not skip an assignment or a class and you'll do great. Have fun !! but still focus on school. Grow up and buckle down. Make upperclassman friends. Older friends are the best. You have to work extremely hard and put in much more effort than you did at MSMS. Don't randomly stop in the hallway. ALWAYS study for tests and quizzes. There is no pool on the third floor. Do what your (sic) told. Don't be shy and don't be annoying. Be yourself and always try your best. Become more mature. People don't hold your hand anymore. There is more independence. High school isn't harder. It's just different. Don't be scared, just jump in and before you know it you'll love it. *A lot of students recommended these two tips in particular: get involved, do your homework. We look forward to welcoming you to BHS in the fall. Have a safe and happy summer! The Guidance Department will host a breakfast called “College Topics For The Summer”. The purpose of this breakfast is so the counseling staff can give a very brief overview of important tasks associated with the college selection and application process. Although this event is geared for parents of juniors, ALL parents are welcome to attend. Please join us for this informative event. We look forward to seeing you on June 11th at 8:30 AM in the Guidance College and Career Center. We ask that parents RSVP at 781-270-1780. Despite all the opportunities to explore colleges through websites, virtual tours, and social media, nothing beats an actual visit to a campus. April is a great time to tour a few colleges that you’re considering because the weather is warmer (hopefully), juniors have a week off for vacation, and colleges are still in session, which means you get to see the campus when it's active and busy. Here are some tips for making the most of a visit to a college. 1) Let the admissions office know you're coming. Sign up for an official campus tour, including the information session if you have time. It's important for admissions to know that you have their college on your radar screen and vice versa. Some colleges even track how much "demonstrated interest" a student has shown through contact with them, and the college tour can be a significant factor for some schools. One side note about questions: While specific questions are always helpful, try not to ask questions that are easily answered elsewhere, such as on a college’s website. For example, asking an admissions officer whether there's an ice skating rink on campus can indicate that you haven't done much advance research. Asking how much ice time is available for different competitive or club sports shows that you’ve done a little homework. Try to get answers to the big questions before you visit. 3) Take notes. You can take notes on your phone or on paper or both. Ask the guide if it's OK to take pictures. (It usually is, but as a courtesy you should ask. As a general rule, though, NEVER take pictures that include the faces of students on campus.) Here's a photo-taking tip: before you enter a building, take a picture of the name of the building or of a sign that indicates you’re in a specific department or area. This way you'll know that all the pictures that follow were taken in that specific place, and you don’t have to write as much down. 5) Be reasonable AND also trust your gut. Let’s face it, touring a campus on a cold or rainy day is not going to be a lot of fun, but don’t rule out a college because of uncontrollable factors, like the weather or a less-than-stellar tour guide. On the other hand, sometimes after a tour or after doing research, a campus simply “doesn’t feel right,” even if you saw it on a beautifully sunny day. If that’s the case for you, take the college off your list. Part of touring is the process of elimination. 6) Finally, be sure to keep refining your list of wants and needs, and if you find that those are changing, complete new college searches. Talk to friends, relatives and teachers about their college experiences and alma maters, but remember that you are the one who will be spending the next four years on a campus. Ultimately, the college you choose should be one that is the best fit for YOU. 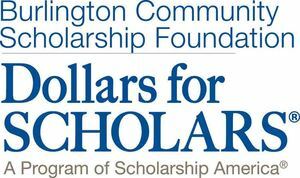 The deadline for the Burlington Community Scholarship Foundation Scholarship process is Friday April 18th. As a reminder seniors need to create a profile at the Burlington Dollars for Scholars web-site by April 18. For students under 18, parents must complete a portion of the application.The web-site can be found by clicking here. We encourage ALL seniors to complete this application, and submit your name for as many scholarships that you are eligible for. For parents that need help understanding the process please click here for a summary of your role in the application process. Although seniors have been given instructions previously, feel free to click here for specific student instructions. After the profile is complete students MUST submit their name to all matched scholarships. We encourage ALL seniors to complete this process. If you have any questions please contact the Guidance Office at 781-270-1780. The evening session is a great time for families to attend, and we encourage you to suggest it to the parents of your students in particular if you will not be attending the fair. The BHS Guidance Department cordially invites parents of underclassmen ( grades 9, 10 and 11) to join us for the next Guidance Breakfast. The topic will be about College Admission Testing. Our hope to provide parents with a better understanding of standardized tests such as the SAT, ACT and PSAT. The breakfast will be held in the BHS Guidance College and Career Center at 8:30am on Thursday April 10th, 2014. Please RSVP by calling 781-270-1780. We look forward to seeing you! Tuesday April 1st at 2:15, is the deadline for the Burlington High School General Scholarship Application for seniors (BHS Class of 2014). All general scholarship applications must be delivered directly to the Guidance secretaries. A receipt will be given for the General Scholarship Application indicating that the Guidance Department has received the General Scholarship application. This application takes approximately 10 to 15 minutes. Filling this scholarship automatically places your name in the running for over 20 scholarships. We encourage ALL students to apply, whether four year, two year, trade school, etc. As a reminder all applications can be downloaded on the Naviance program, however all applications must be submitted in paper format ONLY to the Guidance Department. Please do not e-mail any completed applications.